For the Queen of Scotland during Mary I's reign, see Mary, Queen of Scots. For other people named Mary I, see Mary I (disambiguation). Mary I (18 February 1516 – 17 November 1558), also known as Mary Tudor, was the Queen of England and Ireland from July 1553 until her death. She is best known for her aggressive attempt to reverse the English Reformation, which had begun during the reign of her father, Henry VIII. The executions that marked her pursuit of the restoration of Roman Catholicism in England and Ireland led to her denunciation as "Bloody Mary" by her Protestant opponents. 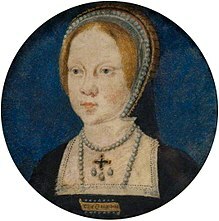 Mary was the only child of Henry VIII by his first wife, Catherine of Aragon, to survive to adulthood. Her younger half-brother Edward VI (son of Henry and Jane Seymour) succeeded their father in 1547 at the age of nine. When Edward became mortally ill in 1553, he attempted to remove Mary from the line of succession because he supposed (correctly) that she would reverse the Protestant reforms that had begun during his reign. On his death, leading politicians proclaimed Lady Jane Grey as queen. Mary speedily assembled a force in East Anglia and deposed Jane, who was ultimately beheaded. Mary was—excluding the disputed reigns of Jane and the Empress Matilda—the first queen regnant of England. In 1554, Mary married Philip of Spain, becoming queen consort of Habsburg Spain on his accession in 1556. During her five-year reign, Mary had over 280 religious dissenters burned at the stake in the Marian persecutions. After Mary's death in 1558, her re-establishment of Roman Catholicism was reversed by her younger half-sister and successor Elizabeth I, daughter of Henry and Anne Boleyn, at the beginning of the 45-year Elizabethan era. Mary was born on 18 February 1516 at the Palace of Placentia in Greenwich, England. She was the only child of King Henry VIII and his first wife Catherine of Aragon to survive infancy. Her mother had suffered many miscarriages. Before Mary's birth, four previous pregnancies had resulted in a stillborn daughter and three short-lived or stillborn sons, including Henry, Duke of Cornwall. Mary was baptised into the Catholic faith at the Church of the Observant Friars in Greenwich three days after her birth. Her godparents included Lord Chancellor Thomas Wolsey; her great-aunt Catherine of York, Countess of Devon; and Agnes Howard, Duchess of Norfolk. Henry VIII's cousin once removed, Margaret Pole, Countess of Salisbury, stood sponsor for Mary's confirmation, which was held immediately after the baptism. The following year, Mary became a godmother herself when she was named as one of the sponsors of her cousin Frances Brandon. In 1520, the Countess of Salisbury was appointed Mary's governess. Sir John Hussey, later Lord Hussey, was her chamberlain from 1530, and his wife, Lady Anne, daughter of George Grey, 2nd Earl of Kent, was one of Mary's attendants. Mary was a precocious child. In July 1520, when scarcely four and a half years old, she entertained a visiting French delegation with a performance on the virginals (a type of harpsichord). A great part of her early education came from her mother, who consulted the Spanish humanist Juan Luis Vives for advice and commissioned him to write De Institutione Feminae Christianae, a treatise on the education of girls. By the age of nine, Mary could read and write Latin. She studied French, Spanish, music, dance, and perhaps Greek. Henry VIII doted on his daughter and boasted to the Venetian ambassador Sebastian Giustiniani, "This girl never cries". Also, as the miniature portrait of her shows, Mary had, like both her parents, a very fair complexion, pale blue eyes and red or reddish-golden hair. She was also ruddy cheeked, a trait she inherited from her father. Despite his affection for Mary, Henry was deeply disappointed that his marriage had produced no sons. By the time Mary was nine years old, it was apparent that Henry and Catherine would have no more children, leaving Henry without a legitimate male heir. In 1525, Henry sent Mary to the border of Wales to preside, presumably in name only, over the Council of Wales and the Marches. She was given her own court based at Ludlow Castle and many of the royal prerogatives normally reserved for the Prince of Wales. Vives and others called her the Princess of Wales, although she was never technically invested with the title. 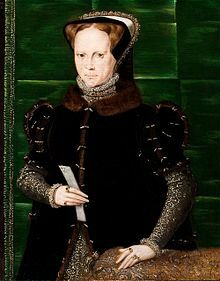 She appears to have spent three years in the Welsh Marches, making regular visits to her father's court, before returning permanently to the home counties around London in mid-1528. Throughout Mary's childhood, Henry negotiated potential future marriages for her. When she was only two years old, she was promised to Francis, the infant son of King Francis I of France, but the contract was repudiated after three years. 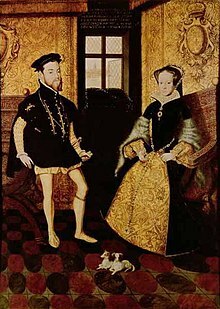 In 1522, at the age of six, she was instead contracted to marry her 22-year-old first cousin, Holy Roman Emperor Charles V. However, the engagement was broken off within a few years by Charles with Henry's agreement. Cardinal Wolsey, Henry's chief adviser, then resumed marriage negotiations with the French, and Henry suggested that Mary marry the Dauphin's father, King Francis I himself, who was eager for an alliance with England. A marriage treaty was signed which provided that Mary marry either Francis I or his second son Henry, Duke of Orleans, but Wolsey secured an alliance with France without the marriage. According to the Venetian Mario Savorgnano, by this time Mary was developing into a pretty, well-proportioned young lady with a fine complexion. Meanwhile, the marriage of Mary's parents was in jeopardy. Disappointed at the lack of a male heir, and eager to remarry, Henry attempted to have his marriage to Catherine annulled, but Pope Clement VII refused his request. Henry claimed, citing biblical passages (Leviticus 20:21), that his marriage to Catherine was unclean because she was the widow of his brother Arthur (Mary's uncle). Catherine claimed that her marriage to Arthur was never consummated and so was not a valid marriage. Her first marriage had been annulled by a previous pope, Julius II, on that basis. Clement may have been reluctant to act because he was influenced by Charles V, Catherine's nephew and Mary's former betrothed, whose troops had surrounded and occupied Rome in the War of the League of Cognac. From 1531, Mary was often sick with irregular menstruation and depression, although it is not clear whether this was caused by stress, puberty or a more deep-seated disease. She was not permitted to see her mother, who had been sent to live away from court by Henry. In early 1533, Henry married Anne Boleyn, who was pregnant with his child, and in May Thomas Cranmer, the Archbishop of Canterbury, formally declared the marriage with Catherine void, and the marriage to Anne valid. Henry repudiated the authority of the Pope, declaring himself Supreme Head of the Church of England. Catherine was demoted to Dowager Princess of Wales (a title she would have held as the widow of Arthur), and Mary was deemed illegitimate. She was styled "The Lady Mary" rather than Princess, and her place in the line of succession was transferred to her newborn half-sister, Elizabeth, Anne's daughter. 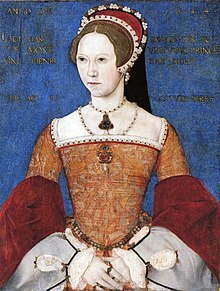 Mary's own household was dissolved; her servants (including the Countess of Salisbury) were dismissed and in December 1533 she was sent to join the household of the infant Elizabeth at Hatfield, Hertfordshire. Mary determinedly refused to acknowledge that Anne was the queen or that Elizabeth was a princess, further enraging King Henry. Under strain and with her movements restricted, Mary was frequently ill, which the royal physician attributed to her "ill treatment". The Imperial ambassador Eustace Chapuys became her close adviser, and interceded, unsuccessfully, on her behalf at court. The relationship between Mary and her father worsened; they did not speak to each other for three years. Although both she and her mother were ill, Mary was refused permission to visit Catherine. When Catherine died in 1536, Mary was "inconsolable". Catherine was interred in Peterborough Cathedral, while Mary grieved in semi-seclusion at Hunsdon in Hertfordshire. In 1536, Queen Anne fell from the king's favour and was beheaded. Elizabeth, like Mary, was declared illegitimate and stripped of her succession rights. Within two weeks of Anne's execution, Henry married Jane Seymour, who urged her husband to make peace with Mary. Henry insisted that Mary recognise him as head of the Church of England, repudiate papal authority, acknowledge that the marriage between her parents was unlawful, and accept her own illegitimacy. She attempted to reconcile with him by submitting to his authority as far as "God and my conscience" permitted, but she was eventually bullied into signing a document agreeing to all of Henry's demands. Reconciled with her father, Mary resumed her place at court. Henry granted her a household (which included the reinstatement of Mary's favourite Susan Clarencieux). Mary's privy purse expenses for this period show that Hatfield House, the Palace of Beaulieu (also called Newhall), Richmond and Hunsdon were among her principal places of residence, as well as Henry's palaces at Greenwich, Westminster and Hampton Court. Her expenses included fine clothes and gambling at cards, one of her favourite pastimes. Rebels in the North of England, including Lord Hussey, Mary's former chamberlain, campaigned against Henry's religious reforms, and one of their demands was that Mary be made legitimate. The rebellion, known as the Pilgrimage of Grace, was ruthlessly suppressed. Along with other rebels, Hussey was executed, but there was no suggestion that Mary was directly involved. The following year, 1537, Jane died after giving birth to a son, Edward. Mary was made godmother to her half-brother and acted as chief mourner at the queen's funeral. Mary was courted by Duke Philip of Bavaria from late 1539, but he was Lutheran and his suit for her hand was unsuccessful. Over 1539, the king's chief minister, Thomas Cromwell, negotiated a potential alliance with the Duchy of Cleves. Suggestions that Mary marry the Duke of Cleves, who was the same age, came to nothing, but a match between Henry and the Duke's sister Anne was agreed. When the king saw Anne for the first time in late December 1539, a week before the scheduled wedding, he did not find himself attracted to her but was unable, for diplomatic reasons and in the absence of a suitable pretext, to cancel the marriage. Cromwell fell from favour and was arrested for treason in June 1540; one of the unlikely charges against him was that he had plotted to marry Mary himself. Anne consented to the annulment of the marriage, which had not been consummated, and Cromwell was beheaded. In 1541, Henry had the Countess of Salisbury, Mary's old governess and godmother, executed on the pretext of a Catholic plot, in which her son (Reginald Pole) was implicated. Her executioner was "a wretched and blundering youth" who "literally hacked her head and shoulders to pieces". In 1542, following the execution of Henry's fifth wife, Catherine Howard, the unmarried Henry invited Mary to attend the royal Christmas festivities. At court, while her father was between marriages and without a consort, Mary acted as hostess. In 1543, Henry married his sixth and last wife, Catherine Parr, who was able to bring the family closer together. Henry returned Mary and Elizabeth to the line of succession, through the Act of Succession 1544, placing them after Edward. However, both remained legally illegitimate. Henry VIII died in 1547 and Edward succeeded him. Mary inherited estates in Norfolk, Suffolk and Essex, and was granted Hunsdon and Beaulieu as her own. Since Edward was still a child, rule passed to a regency council dominated by Protestants, who attempted to establish their faith throughout the country. For example, the Act of Uniformity 1549 prescribed Protestant rites for church services, such as the use of Thomas Cranmer's new Book of Common Prayer. Mary remained faithful to Roman Catholicism and defiantly celebrated the traditional Mass in her own chapel. She appealed to her cousin Emperor Charles V to apply diplomatic pressure demanding that she be allowed to practise her religion. For most of Edward's reign, Mary remained on her own estates and rarely attended court. A plan between May and July 1550 to smuggle her out of England to the safety of the European mainland came to nothing. Religious differences between Mary and Edward continued. When Mary was in her thirties, she attended a reunion with Edward and Elizabeth for Christmas 1550, where the 13-year-old Edward embarrassed Mary, and reduced both her and himself to tears in front of the court, by publicly reproving her for ignoring his laws regarding worship. Mary repeatedly refused Edward's demands that she abandon Catholicism, and Edward persistently refused to drop his demands. On 6 July 1553, at the age of 15, Edward VI died from a lung infection, possibly tuberculosis. He did not want the crown to go to Mary, because he feared she would restore Catholicism and undo his reforms as well as those of Henry VIII, and so he planned to exclude her from the line of succession. His advisers, however, told him that he could not disinherit only one of his half-sisters: he would have to disinherit Elizabeth as well, even though she was a Protestant. Guided by John Dudley, 1st Duke of Northumberland, and perhaps others, Edward excluded both from the line of succession in his will. Contradicting the Succession Act, which restored Mary and Elizabeth to the line of succession, Edward named Dudley's daughter-in-law Lady Jane Grey, the granddaughter of Henry VIII's younger sister, Mary, as his successor. Lady Jane's mother was Frances Brandon, Mary's cousin and goddaughter. Just before Edward VI's death, Mary was summoned to London to visit her dying brother. She was warned, however, that the summons was a pretext on which to capture her and thereby facilitate Lady Jane's accession to the throne. Therefore, instead of heading to London from her residence at Hunsdon, Mary fled into East Anglia, where she owned extensive estates and Dudley had ruthlessly put down Kett's Rebellion. Many adherents to the Catholic faith, opponents of Dudley's, lived there. On 9 July, from Kenninghall, Norfolk, she wrote to the privy council with orders for her proclamation as Edward's successor. On 10 July 1553, Lady Jane was proclaimed queen by Dudley and his supporters, and on the same day Mary's letter to the council arrived in London. By 12 July, Mary and her supporters had assembled a military force at Framlingham Castle, Suffolk. Dudley's support collapsed, and Mary's grew. Jane was deposed on 19 July. She and Dudley were imprisoned in the Tower of London. Mary rode triumphantly into London on 3 August 1553, on a wave of popular support. She was accompanied by her half-sister Elizabeth and a procession of over 800 nobles and gentlemen. One of Mary's first actions as queen was to order the release of the Roman Catholic Duke of Norfolk and Stephen Gardiner from imprisonment in the Tower of London, as well as her kinsman Edward Courtenay. Mary understood that the young Lady Jane was essentially a pawn in Dudley's scheme, and Dudley was the only conspirator of rank executed for high treason in the immediate aftermath of the coup. Lady Jane and her husband, Lord Guildford Dudley, though found guilty, were kept under guard in the Tower rather than immediately executed, while Lady Jane's father, Henry Grey, 1st Duke of Suffolk, was released. Mary was left in a difficult position, as almost all the Privy Counsellors had been implicated in the plot to put Lady Jane on the throne. She appointed Gardiner to the council and made him both Bishop of Winchester and Lord Chancellor, offices he held until his death in November 1555. Susan Clarencieux became Mistress of the Robes. On 1 October 1553, Gardiner crowned Mary at Westminster Abbey. At age 37, Mary turned her attention to finding a husband and producing an heir, which would prevent the Protestant Elizabeth (still next-in-line under the terms of Henry VIII's will and the Act of Succession of 1544) from succeeding to the throne. Edward Courtenay and Reginald Pole were both mentioned as prospective suitors, but her cousin Charles V suggested she marry his only son, Prince Philip of Spain. Philip had a son from a previous marriage and was heir apparent to vast territories in Continental Europe and the New World. As part of the marriage negotiations, a portrait of Philip, by Titian, was sent to her in the latter half of 1553. Lord Chancellor Gardiner and the House of Commons unsuccessfully petitioned her to consider marrying an Englishman, fearing that England would be relegated to a dependency of the Habsburgs. The marriage was unpopular with the English; Gardiner and his allies opposed it on the basis of patriotism, while Protestants were motivated by a fear of Catholicism. When Mary insisted on marrying Philip, insurrections broke out. Thomas Wyatt the younger led a force from Kent to depose Mary in favour of Elizabeth, as part of a wider conspiracy now known as Wyatt's rebellion, which also involved the Duke of Suffolk, the father of Lady Jane. Mary declared publicly that she would summon Parliament to discuss the marriage, and if Parliament decided that the marriage was not to the advantage of the kingdom, she would refrain from pursuing it. On reaching London, Wyatt was defeated and captured. Wyatt, the Duke of Suffolk, his daughter Lady Jane, and her husband Guildford Dudley were executed. Courtenay, who was implicated in the plot, was imprisoned, and then exiled. Elizabeth, though protesting her innocence in the Wyatt affair, was imprisoned in the Tower of London for two months, then was put under house arrest at Woodstock Palace. Mary was—excluding the brief, disputed reigns of the Empress Matilda and Lady Jane Grey—England's first queen regnant. Further, under the English common law doctrine of jure uxoris, the property and titles belonging to a woman became her husband's upon marriage, and it was feared that any man she married would thereby become King of England in fact and in name. While Mary's grandparents, Ferdinand and Isabella, had retained sovereignty of their own realms during their marriage, there was no precedent to follow in England. Under the terms of Queen Mary's Marriage Act, Philip was to be styled "King of England", all official documents (including Acts of Parliament) were to be dated with both their names, and Parliament was to be called under the joint authority of the couple, for Mary's lifetime only. England would not be obliged to provide military support to Philip's father in any war, and Philip could not act without his wife's consent or appoint foreigners to office in England. Philip was unhappy at the conditions imposed, but he was ready to agree for the sake of securing the marriage. He had no amorous feelings toward Mary and sought the marriage for its political and strategic gains; Philip's aide Ruy Gómez de Silva wrote to a correspondent in Brussels, "the marriage was concluded for no fleshly consideration, but in order to remedy the disorders of this kingdom and to preserve the Low Countries." To elevate his son to Mary's rank, Emperor Charles V ceded to Philip the crown of Naples as well as his claim to the Kingdom of Jerusalem. Therefore, Mary became Queen of Naples and titular Queen of Jerusalem upon marriage. Their wedding at Winchester Cathedral on 25 July 1554 took place just two days after their first meeting. Philip could not speak English, and so they spoke in a mixture of Spanish, French, and Latin. In September 1554, Mary stopped menstruating. She gained weight, and felt nauseous in the mornings. For these reasons, almost the entirety of her court, including her doctors, believed her to be pregnant. Parliament passed an act making Philip regent in the event of Mary's death in childbirth. In the last week of April 1555, Elizabeth was released from house arrest, and called to court as a witness to the birth, which was expected imminently. According to Giovanni Michieli, the Venetian ambassador, Philip may have planned to marry Elizabeth in the event of Mary's death in childbirth, but in a letter to his brother-in-law, Maximilian of Austria, Philip expressed uncertainty as to whether his wife was pregnant. Thanksgiving services in the diocese of London were held at the end of April after false rumours that Mary had given birth to a son spread across Europe. Through May and June, the apparent delay in delivery fed gossip that Mary was not pregnant. Susan Clarencieux revealed her doubts to the French ambassador, Antoine de Noailles. Mary continued to exhibit signs of pregnancy until July 1555, when her abdomen receded. There was no baby. Michieli dismissively ridiculed the pregnancy as more likely to "end in wind rather than anything else". It was most likely a false pregnancy, perhaps induced by Mary's overwhelming desire to have a child. In August, soon after the disgrace of the false pregnancy, which Mary considered to be "God's punishment" for her having "tolerated heretics" in her realm, Philip left England to command his armies against France in Flanders. Mary was heartbroken and fell into a deep depression. Michieli was touched by the queen's grief; he wrote she was "extraordinarily in love" with her husband, and was disconsolate at his departure. Elizabeth remained at court until October, apparently restored to favour. In the absence of any children, Philip was concerned that one of the next claimants to the English throne after his sister-in-law was the Queen of Scots, who was betrothed to the Dauphin of France. 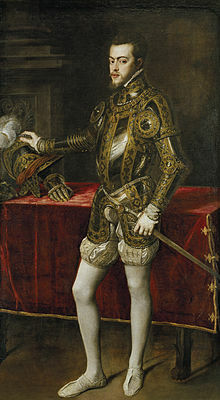 Philip persuaded his wife that Elizabeth should marry his cousin Emmanuel Philibert, Duke of Savoy, to secure the Catholic succession and preserve the Habsburg interest in England, but Elizabeth refused to comply and parliamentary consent was unlikely. Mary by Hans Eworth, 1554. She wears a jewelled pendant bearing the pearl known as La Peregrina set beneath two diamonds. In the month following her accession, Mary issued a proclamation that she would not compel any of her subjects to follow her religion, but by the end of September leading Protestant churchmen—including John Bradford, John Rogers, John Hooper, Hugh Latimer, and Thomas Cranmer—were imprisoned. Mary's first Parliament, which assembled in early October 1553, declared the marriage of her parents valid and abolished Edward's religious laws. Church doctrine was restored to the form it had taken in the 1539 Six Articles, which (among other things) re-affirmed clerical celibacy. Married priests were deprived of their benefices. Mary had always rejected the break with Rome instituted by her father and the establishment of Protestantism by her brother's regents. Philip persuaded Parliament to repeal Henry's religious laws, thus returning the English church to Roman jurisdiction. Reaching an agreement took many months and Mary and Pope Julius III had to make a major concession: the monastery lands confiscated under Henry were not returned to the church but remained in the hands of their influential new owners. By the end of 1554, the pope had approved the deal, and the Heresy Acts were revived. Under the Heresy Acts, numerous Protestants were executed in the Marian persecutions. Around 800 rich Protestants, including John Foxe, chose exile instead. The first executions occurred over a period of five days in early February 1555: John Rogers on 4 February, Laurence Saunders on 8 February, and Rowland Taylor and John Hooper on 9 February. Thomas Cranmer, the imprisoned archbishop of Canterbury, was forced to watch Bishops Ridley and Latimer being burned at the stake. Cranmer recanted, repudiated Protestant theology, and rejoined the Catholic faith. Under the normal process of the law, he should have been absolved as a repentant. Mary, however, refused to reprieve him. On the day of his burning, he dramatically withdrew his recantation. In total, 283 were executed, most by burning. The burnings proved so unpopular that even Alfonso de Castro, one of Philip's own ecclesiastical staff, condemned them and another adviser, Simon Renard, warned him that such "cruel enforcement" could "cause a revolt". Mary persevered with the policy, which continued until her death and exacerbated anti-Catholic and anti-Spanish feeling among the English people. The victims of the persecutions became lauded as martyrs. Reginald Pole, the son of Mary's executed governess and once considered a suitor, arrived as papal legate in November 1554. He was ordained a priest and appointed Archbishop of Canterbury immediately after Cranmer's execution in March 1556. Furthering the Tudor conquest of Ireland, under Mary and Philip's reign English colonists were settled in the Irish Midlands. Queen's and King's Counties (now Counties Laois and Offaly) were founded, and their plantation began. Their principal towns were respectively named Maryborough (now Portlaoise) and Philipstown (now Daingean). In January 1556, Mary's father-in-law abdicated. Mary and Philip were still apart; he was declared King of Spain in Brussels, but she stayed in England. Philip negotiated an unsteady truce with the French in February 1556. The following month, the French ambassador in England, Antoine de Noailles, was implicated in a plot against Mary when Sir Henry Dudley, a second cousin of the executed Duke of Northumberland, attempted to assemble an invasion force in France. The plot, known as the Dudley conspiracy, was betrayed, and the conspirators in England were rounded up. Dudley remained in exile in France, and Noailles prudently left Britain. Philip returned to England from March to July 1557 to persuade Mary to support Spain in a renewed war against France. Mary was in favour of declaring war, but her councillors opposed it because French trade would be jeopardised, it contravened the marriage treaty, and a bad economic legacy from Edward VI's reign and a series of poor harvests meant England lacked supplies and finances. War was only declared in June 1557 after Reginald Pole's nephew, Thomas Stafford, invaded England and seized Scarborough Castle with French help in a failed attempt to depose Mary. As a result of the war, relations between England and the Papacy became strained, since Pope Paul IV was allied with Henry II of France. In August, English forces were victorious in the aftermath of the Battle of Saint Quentin, with one eyewitness stating "Both sides fought most choicely, and the English best of all." Celebrations however, were brief, as in January 1558 French forces took Calais, England's sole remaining possession on the European mainland. Although the territory was financially burdensome, it was an ideological loss that damaged Mary's prestige. According to Holinshed's Chronicles, Mary later lamented, "When I am dead and opened, you shall find 'Calais' lying in my heart", although this may be apocryphal. The years of Mary's reign were consistently wet. The persistent rain and subsequent flooding led to famine. Another problem was the decline of the Antwerp cloth trade. Despite Mary's marriage to Philip, England did not benefit from Spain's enormously lucrative trade with the New World. The Spanish guarded their trade routes jealously, and Mary could not condone illicit trade or piracy against her husband. In an attempt to increase trade and rescue the English economy, Mary's counsellors continued Northumberland's policy of seeking out new commercial opportunities. She granted a royal charter to the Muscovy Company, whose first governor was Sebastian Cabot, and commissioned a world atlas from Diogo Homem. Adventurers such as John Lok and William Towerson sailed south in an attempt to develop links with the coast of Africa. Financially, Mary's regime tried to reconcile a modern form of government—with correspondingly higher spending—with a medieval system of collecting taxation and dues. Mary retained the Edwardian appointee William Paulet, 1st Marquess of Winchester, as Lord High Treasurer and assigned him to oversee the revenue collection system. A failure to apply new tariffs to new forms of imports meant that a key source of revenue was neglected. To solve this problem, Mary's government published a revised "Book of Rates" (1558), which listed the tariffs and duties for every import. This publication was not extensively reviewed until 1604. English coinage was debased under both Henry VIII and Edward VI. Mary drafted plans for currency reform but they were not implemented until after her death. After Philip's visit in 1557, Mary thought she was pregnant again, with a baby due in March 1558. She decreed in her will that her husband would be the regent during the minority of their child. However, no child was born, and Mary was forced to accept that Elizabeth would be her lawful successor. Mary was weak and ill from May 1558. In pain, possibly from ovarian cysts or uterine cancer, she died on 17 November 1558, aged 42, at St James's Palace, during an influenza epidemic that also claimed the life of Reginald Pole later the same day. She was succeeded by her half-sister Elizabeth. Philip, who was in Brussels, wrote to his sister Joan: "I felt a reasonable regret for her death." Although Mary's will stated that she wished to be buried next to her mother, she was interred in Westminster Abbey on 14 December, in a tomb she would eventually share with Elizabeth. The Latin inscription on their tomb, Regno consortes et urna, hic obdormimus Elizabetha et Maria sorores, in spe resurrectionis (affixed there by James I when he succeeded Elizabeth), translates to: "Consorts in realm and tomb, we, sisters Elizabeth and Mary, here lie down to sleep in hope of resurrection." At her funeral service, John White, bishop of Winchester, praised Mary: "She was a king's daughter; she was a king's sister; she was a king's wife. She was a queen, and by the same title a king also." She was the first woman to successfully claim the throne of England, despite competing claims and determined opposition, and enjoyed popular support and sympathy during the earliest parts of her reign, especially from the Roman Catholics of England. Protestant writers at the time, and since, have often taken a highly negative view of Mary's reign. By the 17th century, the memory of her religious persecutions had led to the adoption of her sobriquet "Bloody Mary". John Knox attacked her in his First Blast of the Trumpet against the Monstrous Regiment of Women (1558), and she was prominently vilified in Actes and Monuments (1563), by John Foxe. Subsequent editions of Foxe's book remained popular throughout the following centuries and helped shape enduring perceptions of Mary as a bloodthirsty tyrant. Mary is remembered in the 21st century for her vigorous efforts to restore the primacy of Roman Catholicism in England after the rise of Protestant influence during the short-lived reign of her half-brother, Edward. Protestant historians have long denigrated her reign, emphasizing that in just five years she burned several hundred Protestants at the stake in the Marian persecutions. In the mid-20th century, H. F. M. Prescott attempted to redress the tradition that Mary was intolerant and authoritarian, and scholarship since then has tended to view the older, simpler assessments of Mary with increasing reservations. A historiographical revisionism since the 1980s has to some degree improved her reputation among scholars. Christopher Haigh argued that her revival of religious festivities and Catholic practices was generally welcomed. Haigh concluded that the "last years of Mary's reign were not a gruesome preparation for Protestant victory, but a continuing consolidation of Catholic strength." Catholic historians, such as John Lingard, thought Mary's policies failed not because they were wrong but because she had too short a reign to establish them and because of natural disasters beyond her control. In other countries, the Catholic Counter-Reformation was spearheaded by Jesuit missionaries; Mary's chief religious advisor, Cardinal Reginald Pole, refused to allow the Jesuits into England. Her marriage to Philip was unpopular among her subjects and her religious policies resulted in deep-seated resentment. The military loss of Calais to France was a bitter humiliation to English pride. Failed harvests increased public discontent. Philip spent most of his time abroad, while his wife remained in England, leaving her depressed at his absence and undermined by their inability to have children. After Mary's death, Philip sought to marry Elizabeth but she refused him. Although Mary's rule was ultimately ineffectual and unpopular, the policies of fiscal reform, naval expansion, and colonial exploration that were later lauded as Elizabethan accomplishments were started in Mary's reign. When Mary ascended the throne, she was proclaimed under the same official style as Henry VIII and Edward VI: "Mary, by the Grace of God, Queen of England, France and Ireland, Defender of the Faith, and of the Church of England and of Ireland on Earth Supreme Head". The title Supreme Head of the Church was repugnant to Mary's Catholicism, and she omitted it after Christmas 1553. Under Mary's marriage treaty with Philip, the official joint style reflected not only Mary's but also Philip's dominions and claims: "Philip and Mary, by the grace of God, King and Queen of England, France, Naples, Jerusalem, and Ireland, Defenders of the Faith, Princes of Spain and Sicily, Archdukes of Austria, Dukes of Milan, Burgundy and Brabant, Counts of Habsburg, Flanders and Tyrol". This style, which had been in use since 1554, was replaced when Philip inherited the Spanish Crown in 1556 with "Philip and Mary, by the Grace of God King and Queen of England, Spain, France, both the Sicilies, Jerusalem and Ireland, Defenders of the Faith, Archdukes of Austria, Dukes of Burgundy, Milan and Brabant, Counts of Habsburg, Flanders and Tyrol". 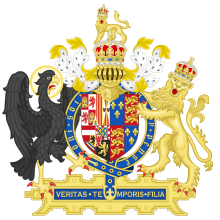 Mary I's coat of arms was the same as those used by all her predecessors since Henry IV: Quarterly, Azure three fleurs-de-lys Or [for France] and Gules three lions passant guardant in pale Or (for England). Sometimes, her arms were impaled (depicted side-by-side) with those of her husband. She adopted "Truth, the Daughter of Time" (Latin: Veritas Temporis Filia) as her personal motto. Both Mary and Philip were descended from John of Gaunt, the Duke of Lancaster, a relationship that was used to portray Philip as an English king. They descended from Lancaster and his first two wives: Blanche of Lancaster (grandmother of John, Constable of Portugal) and Constance of Castile (mother of Catherine of Lancaster). Mary also descended from Lancaster and his third wife, Katherine Swynford (grandmother of John Beaufort, 1st Duke of Somerset and Cecily Neville). ^ Her half-brother died on 6 July; she was proclaimed his successor in London on 19 July; her regnal years were dated from 24 July (Weir, p. 160). ^ Although he was in deacon's orders and prominent in the church, Pole was not ordained until the day before his consecration as archbishop (Loades, p. 319). ^ "Spain: August 1557 | British History Online". www.british-history.ac.uk. Retrieved 4 June 2018. Haigh, Christopher (1992). English Reformations: religion, politics and society under the Tudors. Oxford: Clarendon Press. Weikel, Ann (2004; online edition 2008). 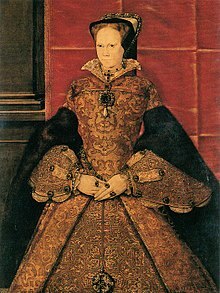 "Mary I (1516–1558)" in Oxford Dictionary of National Biography (subscription or UK public library membership required). Oxford University Press. doi:10.1093/ref:odnb/18245. Doran, Susan and Thomas Freeman, eds. (2011). Mary Tudor: Old and New Perspectives. Palgrave MacMillan. Madden, Frederick, Privy Purse Expenses of the Princess Mary, 1536-1544 (London, 1831). Wernham, R. B. (1966). Before the Armada: the growth of English foreign policy, 1485-1588. London: Jonathan Cape. 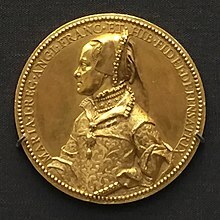 Wikimedia Commons has media related to Mary I of England. "Mary I (1516-1558)" . Dictionary of National Biography. London: Smith, Elder & Co. 1885–1900. Chisholm, Hugh, ed. (1911). "Mary I., Queen" . Encyclopædia Britannica (11th ed.). Cambridge University Press.